A proven system I used to better manage my bipolar disorder – including details on how they work and action steps. Bonus: I tell you tips to get the most out of your bipolar online counseling session. Do you ever feel stuck in the depths of some horrid mood swings? It’s like being strapped down to a roller coaster train – you can’t get off the ride & you have no control over the manic twists and turns. On other days, you feel like extra baggage just weighs you down into bipolar depression. If you have bipolar disorder, you know these symptoms well. Need to talk? Trust that feeling. Bipolar counseling is an essential part of treatment. 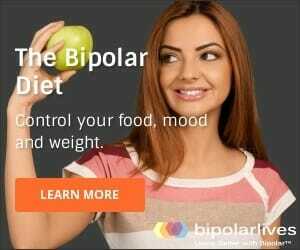 Study after study shows that the most effective treatment for bipolar disorder is a combination of bipolar medications and talk therapy. 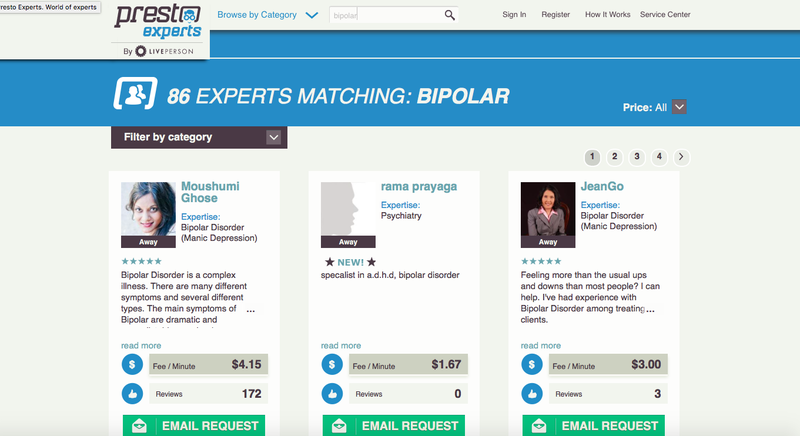 One really interesting innovation to talk therapy is bipolar online counseling. Action Step: When you feel the need to talk to a counselor or therapist, don’t run away from it. Instead, jot down on a piece of paper 3 things on your mind that are bothering you. That way, you know exactly why you need to talk to a professional. Benefit #1: Time and place. No matter where you are or what the time it is, with online therapy/counseling there are ALWAYS dozens of recognized professionals available to help you. Benefit #2: Online experts have up-to-date and reliable information on bipolar disorder – and any other conceivable issue you need to talk about. Benefit #3: Online counseling for bipolar or depression gives you access to live professional counselors worldwide. Benefit #4: Get access to therapists from the privacy, comfort, security & convenience of your own home (or any location). Reputable online counseling services such as PrestoExperts, Breakthrough.com and Just Answer are used by thousands of consumers daily and I can highly recommend them all. My favorite is PrestoExperts (Keep reading to learn how to use this service) because they have so many therapists with specific expertise in manic depressive illness and will work with you online, by telephone or via email and offer the best value for money and affordable and transparent pricing. Regardless of whether you need an urgent, one time consultation on an issue of immediate concern, or would like to establish an on-going relationship of counseling, support is right at your fingertips. Imagine total flexibility from a service which is all about YOU. YOU control the level of anonymity and disclosure! Access a worldwide resource for the very best fit and value for money. No travel and no fitting in with someone else’s schedule. So, instead of limiting yourself to the counselors in your immediate area, you can connect to top counselors all over the world. Traveling to your local counselor’s clinic can be both time-consuming and expensive. 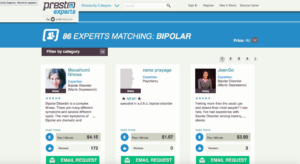 Action Steps: There are two methods to match you with the best bipolar counselor on LivePerson. 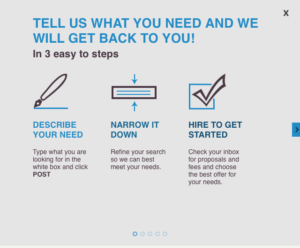 Method #1: Post your needs and PrestoExperts will match you with the right experts. Describe what your needs are into the white box shown (the picture above is for example purposes only: I entered in a list of needs that may be specific for me). After you type in your needs in the white box, click POST. 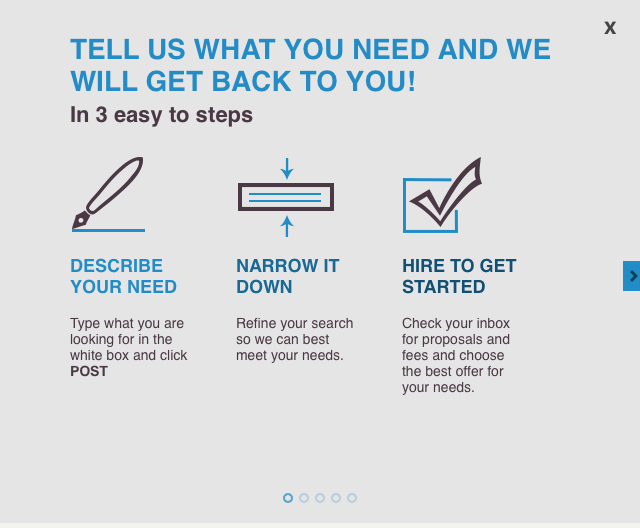 After some tweaking to narrow down your matches, you’ll receive proposals & fees in your inbox. Method #2: Browse and choose your own online bipolar counselor. 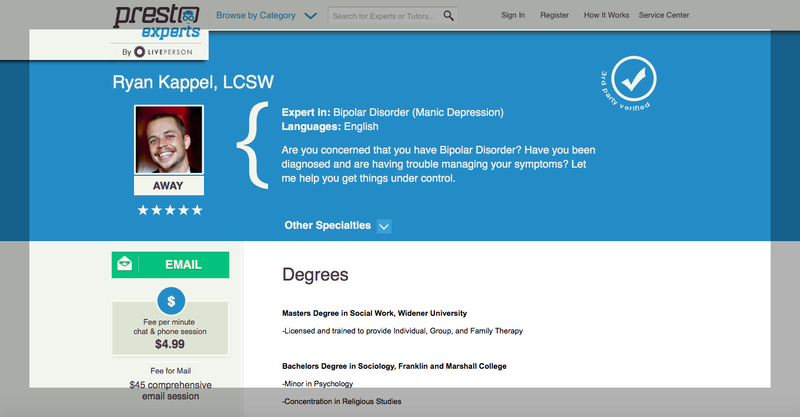 In the search bar, type in keywords such as “bipolar,” “bipolar counselor,” “bipolar therapist,” etc. After you press enter, you’ll be shown a number of matches. Click on any match and you’ll be shown a detailed description of their expertise, degrees, rate, services, & reviews from former clients. If you like your match, click the green EMAIL button send him or her a message. There are 3 options when you sign up for online counseling. Most reputable services will provide the first few minutes of Live Chats 100% FREE. Payment will only begin if you you choose this particular expert for your bipolar counseling. Make the most of Live Chat by using the beginning of the conversation to air all your concerns, ask your questions, negotiate a fee that is in line with your budget and make sure this is truly the right expert for you. Use this option if you find that writing helps you with organization and focus. You will get max value for money if you don’t waste time getting to the point! Sometimes our illness makes it hard to organize our thoughts and can result in a rambling or discursive speaking style which chews up therapy time. Having to write makes it easier to structure and prioritize and there is no charge for the time spent composing your email to your therapist. You can go at your own pace and get counseling from someone who has also had time to reflect on your content. Privacy and security are paramount and you can be confident of being protected. ALWAYS ask about what privacy protection and security mechanisms are in place. How exactly does it all work? With a professional provider, you are completely protected. No charges are incurred until you clarify initial questions and reach a clear and mutual agreement over fees. If you opt for an email session, payment occurs when the session completes. Some people are talkers – If you’re one of them, you can set up a telephone counseling session with your online therapist. Every day I get requests from individuals – The problem, however, is that I am NOT a medical expert and am not professionally qualified. The most positive changes occur when you express yourself in a peer group support system. This includes having a professional to talk with. Please do not take chances with your health by attempting to obtain therapy from a stranger – use an established bipolar counseling provider1 for a properly trained and accredited expert therapist. Action Step: Comment below. What is your experience with talk therapy? (In-person or online). II am emotionally involved with a male friend who is bipolar and takes Adderal for Add. He was incarcerated for 20 years of a 50 year sentence for writing checks from his company while in a manic episode and not on medication. He bought items such as a vacuum cleaner and new clothes. It was 5 checks in all valuing very little money. He was an attorney at the time, and lost the right to practice. After three years as a model prisoner, the DA in Houston blocked his parole.He went through colon cancer, with a colostomy bag, while incarcerated, and just finished forty rounds of radiation treatment for prostate cancer. He admits that he was very arrogant at the time of his conviction, but also feels that the judge “threw the book at him” with the length of the sentence. He has not been able to rent a decent place to live or find a job that pays well. He drives for Uber. I believe, as does he, that his bipolar diagnosis, which was evaluated as he was getting his sentence, was not taken into consideration. Is there any action he can take at his time? He earned a PHD in philosophy while in prison. I have known him since college forty years ago, and see no violent tendencies in this man. I have been around him for over three months almost every day now, and feel that I have seen him in the worst of circumstances. The only place of residence he could find in which to reside, is a pit of delinquent people. He was just served with a warrant for his arrest for allegedly ruining the paint job on the car of a visitor to the residence. He has had to hire an attorney, and I have watched him go through torture as he looks at the possibility of life in prison. He has not been able to sleep or eat. He had extremely cruel treatment in prison, and is terrified of returning, especially for the remainder of his life. I am supporting him one hundred per cent. My sister is bipolar, and I understand the disease. Where can he get some help? He is unaware that I have written you. I don’t know all the circumstances involved in such a long prison sentence, but what I observe in him now does not show me a person who should have spent that amount of time in the prison system Stories of the things done to him not only by inmates, but by the prison staff and parole officers, give me cold chills. He is attending my church with me, and is very open about his mistakes. He feels that he has an “X” on his back that will stigmatize him for life. Please advise me where I can get him some help. .Has the status of a person who is bipolar changed as far as a conviction would be concerned in court in the past 25 years? The world is very cruel for even the most mentally stable of us so for us who have emotional illness life can be so difficult. It sounds like your friend got a very bad deal and continues to suffer injustice because of his mental illnesses. My heart goes out to such ones. Certainly he is in need of treatment. Maybe you can assist him to get some quality care. Sounds like he lives in an unstable environment. Maybe there are better places he could stay. (National Alliance of Mentally Ill)? Because the lay people will not be able to help you. The president is there for a reason. He/she believes in the cause. I am sorry that you and your friend are having to go through this ordeal. I agree-I think the DA used your friend as an example.